It was about a 3 hour drive to Agra on a major highway, first passing by the construction of a major city. I’ve never seen an entire city under construction. The topography was dry and rural with scattered villages, mud huts and concrete settlements. The arrival in Agra was more “organized chaos” as often describes India. I’d say it was an awful place except for maybe the top hotels, Agra Fort and the Taj Mahal – but hate to sound too negative. Despite being an awful city, the Taj as locals call it, is probably the most awe inspiring building I’ve ever seen. Hate to admit it probably trumps my beloved Duomo in Florence or the Golden Gate Bridge. Take a look at my pictures which I hope present a different view of it than you might be used to seeing. But photos won’t it justice so you’ll have to go there. I won’t even attempt to describe my reaction either to the play of light on the building at various times. Remember, Delhi is a nonstop flight away from New York or Chicago. Oh, we did see scavenging cows and playful monkeys on the street as we approached for our morning visit. Agra Fort, across the river from the Taj, is another royal residence to add to the list seen on this trip. It’s a UNESCO World Heritage Site (1 of 4 in the area) vs. Amber Fort in Jaipur which is not due to a botched restoration. The Oberoi Amarvilas is the address in town – with all rooms facing the Taj. What a way to wake up or have a drink at sunset on your balcony with cocktail in hand. Or you can just hang out in the hotel’s bar to share the memory with your fellow travelers. As I always say, it’s not the hardware that makes a great hotel — it’s the people and so far on this trip the hotel staffs have been superb. Above and beyond anything I’ve experienced anywhere in my worldwide travels. 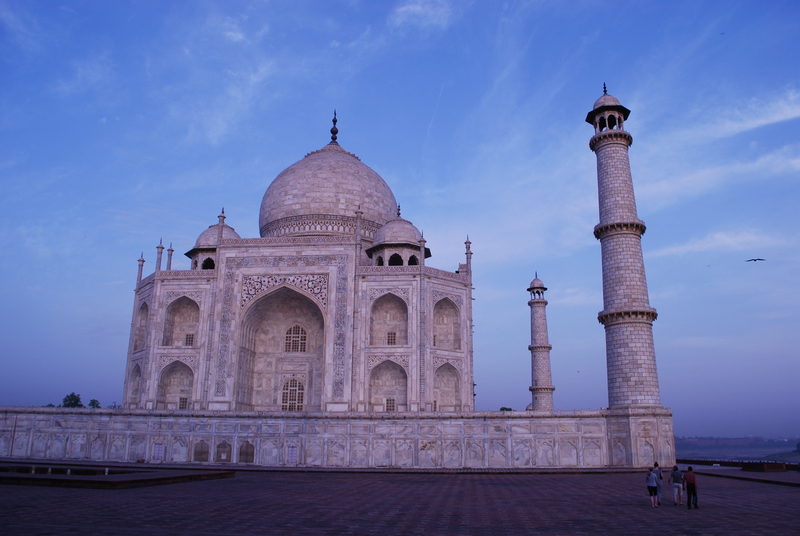 As I told you, the Taj is truly amazing! It’s amazing how the town is such a mess, with the Taj around the corner. How did you enjoy the traffic on your 3 hour ride. Crazy!! We saw that the temperature is 100. Stay cool. The traffic was only bad once we hit town.. Loved the 2 ox driven cart behind us. The drive to Jaipur was less fun 🙁 The temp has been I’m sure over 100 every day but the good part is the crowds are less than in the winter. Off to Ananda in the Himalayas today!